Synchronous drives are especially well-suited for low-speed, high torque applications. Their positive driving nature prevents potential slippage associated with V-belt drives, and even allows significantly greater torque carrying capability. Small pitch synchronous drives operating at speeds of 50 ft/min (0.25 m/s) or less are considered to be low-speed. Care should be taken in the drive selection process as stall and peak torques can sometimes be very high. While intermittent peak torques can often be carried by synchronous drives without special considerations, high cyclic peak torque loading should be carefully reviewed. Proper belt installation tension and rigid drive bracketry and framework is essential in preventing belt tooth jumping under peak torque loads. It is also helpful to design with more than the normal minimum of 6 belt teeth in mesh to ensure adequate belt tooth shear strength. 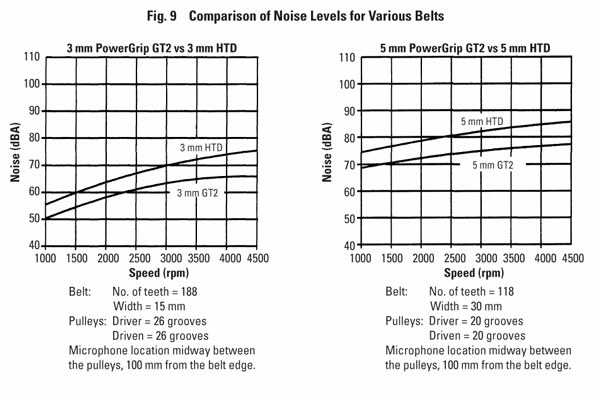 Newer generation curvilinear systems like PowerGrip GT2 and PowerGrip HTD should be used in low-speed, high torque applications, as trapezoidal timing belts are more prone to tooth jumping, and have significantly less load carrying capacity. Synchronous belt drives are often used in high-speed applications even though V-belt drives are typically better suited. They are often used because of their positive driving characteristic (no creep or slip), and because they require minimal maintenance (don't stretch significantly). A significant drawback of high-speed synchronous drives is drive noise. High-speed synchronous drives will nearly always produce more noise than V-belt drives. Small pitch synchronous drives operating at speeds in excess of 1300 ft/min (6.6 m/s) are considered to be high-speed. Special consideration should be given to high-speed drive designs, as a number of factors can significantly influence belt performance. Cord fatigue and belt tooth wear are the two most significant factors that must be controlled to ensure success. Moderate pulley diameters should be used to reduce the rate of cord flex fatigue. Designing with a smaller pitch belt will often provide better cord flex fatigue characteristics than a larger pitch belt. PowerGrip GT2 is especially well suited for high-speed drives because of its excellent belt tooth entry/exit characteristics. Smooth interaction between the belt tooth and pulley groove minimizes wear and noise. Belt installation tension is especially critical with high-speed drives. Low belt tension allows the belt to ride out of the driven pulley, resulting in rapid belt tooth and pulley groove wear. Some ultrasensitive applications require the belt drive to operate with as little vibration aspossible, as vibration sometimes has an effect on the system operation or finished manufactured product. In these cases, the characteristics and properties of all appropriate belt drive products should be reviewed. The final drive system selection should be based upon the most critical design requirements, and may require some compromise. Vibration is not generally considered to be a problem with synchronous belt drives. Low levels of vibration typically result from the process of tooth meshing and/or as a result of their high tensile modulus properties. Vibration resulting from tooth meshing is a normal characteristic of synchronous belt drives, and cannot be completely eliminated. It can be minimized by avoiding small pulley diameters, and instead choosing moderate sizes. The dimensional accuracy of the pulleys also influences tooth meshing quality. Additionally, the installation tension has an impact on meshing quality. PowerGrip GT2 drives mesh very cleanly, resulting in the smoothest possible operation. Vibration resulting from high tensile modulus can be a function of pulley quality. Radial run out causes belt tension variation with each pulley revolution. V-belt pulleys are also manufactured with some radial run out, but V-belts have a lower tensile modulus resulting in less belt tension variation. The high tensile modulus found in synchronous belts is necessary to maintain proper pitch under load. Drive noise evaluation in any belt drive system should be approached with care. There are many potential sources of noise in a system, including vibration from related components, bearings, and resonance and amplification through framework and panels. Synchronous belt drives typically produce more noise than V-belt drives. Noise results from the process of belt tooth meshing and physical contact with the pulleys. The sound pressure level generally increases as operating speed and belt width increase, and as pulley diameter decreases. Drives designed on moderate pulley sizes without excessive capacity (overdesigned) are generally the quietest. PowerGrip GT2 drives have been found to be significantly quieter than other systems due to their improved meshing characteristic, see Figure 9. Polyurethane belts generally produce more noise than neoprene belts. Proper belt installation tension is also very important in minimizing drive noise. The belt should be tensioned at a level that allows it to run with as little meshing interference as possible. Drive alignment also has a significant effect on drive noise. Special attention should be given to minimizing angular misalignment (shaft parallelism). This assures that belt teeth are loaded uniformly and minimizes side tracking forces against the flanges. Parallel misalignment (pulley offset) is not as critical of a concern as long as the belt is not trapped or pinched between opposite flanges (see the special section dealing with drive alignment). Pulley materials and dimensional accuracy also influence drive noise. Some users have found that steel pulleys are the quietest, followed closely by aluminum. Polycarbonates have been found to be noisier than metallic materials. Machined pulleys are generally quieter than molded pulleys. The reasons for this revolve around material density and resonance characteristics as well as dimensional accuracy. Small synchronous rubber or urethane belts can generate an electrical charge while operating on a drive. Factors such as humidity and operating speed influence the potential of the charge. If determined to be a problem, rubber belts can be produced in a conductive construction to dissipate the charge into the pulleys, and to ground. This prevents the accumulation of electrical charges that might be detrimental to material handling processes or sensitive electronics. It also greatly reduces the potential for arcing or sparking in flammable environments. Urethane belts cannot be produced in a conductive construction. RMA has outlined standards for conductive belts in their bulletin IP-3-3. Unless otherwise specified, a static conductive construction for rubber belts is available on a made-to-order basis. Unless otherwise specified, conductive belts will be built to yield a resistance of 300,000 ohms or less, when new. Nonconductive belt constructions are also available for rubber belts. These belts are generally built specifically to the customers conductivity requirements. They are generally used in applications where one shaft must be electrically isolated from the other. It is important to note that a static conductive belt cannot dissipate an electrical charge through plastic pulleys. At least one metallic pulley in a drive is required for the charge to be dissipated to ground. A grounding brush or similar device may also be used to dissipate electrical charges. Urethane timing belts are not static conductive and cannot be built in a special conductive construction. Special conductive rubber belts should be used when the presence of an electrical charge is a concern. Synchronous drives are suitable for use in a wide variety of environments. Special considerations may be necessary, however, depending on the application. Dust: Dusty environments do not generally present serious problems to synchronous drives as long as the particles are fine and dry. Particulate matter will, however, act as an abrasive resulting in a higher rate of belt and pulley wear. Damp or sticky particulate matter deposited and packed into pulley grooves can cause belt tension to increase significantly. This increased tension can impact shafting, bearings, and framework. Electrical charges within a drive system can sometimes attract particulate matter. Debris: Debris should be prevented from falling into any synchronous belt drive. Debris caught in the drive is generally either forced through the belt or results in stalling of the system. In either case, serious damage occurs to the belt and related drive hardware. Water: Light and occasional contact with water (occasional wash downs) should not seriously affect synchronous belts. Prolonged contact (constant spray or submersion) results in significantly reduced tensile strength in fiberglass belts, and potential length variation in aramid belts. Prolonged contact with water also causes rubber compounds to swell, although less than with oil contact. Internal belt adhesion systems are also gradually broken down with the presence of water. Additives to water, such as lubricants, chlorine, anticorrosives, etc. can have a more detrimental effect on the belts than pure water. Urethane timing belts also suffer from water contamination. Polyester tensile cord shrinks significantly and experiences loss of tensile strength in the presence of water. Aramid tensile cord maintains its strength fairly well, but experiences length variation. Urethane swells more than neoprene in the presence of water. This swelling can increase belt tension significantly, causing belt and related hardware problems. Oil: Light contact with oils on an occasional basis will not generally damage synchronous belts. Prolonged contact with oil or lubricants, either directly or airborne, results in significantly reduced belt service life. Lubricants cause the rubber compound to swell, breakdown internal adhesion systems, and reduce belt tensile strength. While alternate rubber compounds may provide some marginal improvement in durability, it is best to prevent oil from contacting synchronous belts. Dust Generation: Rubber synchronous belts are known to generate small quantities of fine dust, as a natural result of their operation. The quantity of dust is typically higher for new belts, as they run in. The period of time for run in to occur depends upon the belt and pulley size, loading and speed. Factors such as pulley surface finish, operating speeds, installation tension, and alignment influence the quantity of dust generated. Clean Room: Rubber synchronous belts may not be suitable for use in clean room environments, where all potential contamination must be minimized or eliminated. Urethane timing belts typically generate significantly less debris than rubber timing belts. However, they are recommended only for light operating loads. Also, they cannot be produced in a static conductive construction to allow electrical charges to dissipate. Static Sensitive: Applications are sometimes sensitive to the accumulation of static electrical charges. Electrical charges can affect material handling processes (like paper and plastic film transport), and sensitive electronic equipment. Applications like these require a static conductive belt, so that the static charges generated by the belt can be dissipated into the pulleys, and to ground. Standard rubber synchronous belts do not meet this requirement, but can be manufactured in a static conductive construction on a made-to-order basis. Normal belt wear resulting from long term operation or environmental contamination can influence belt conductivity properties. In sensitive applications, rubber synchronous belts are preferred over urethane belts since urethane belting cannot be produced in a conductive construction. Tensile Cord Twist: Tensile cords are formed into a single twist configuration during their manufacture. Synchronous belts made with only single twist tensile cords track laterally with a significant force. 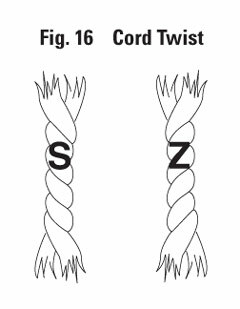 To neutralize this tracking force, tensile cords are produced in right- and left-hand twist (or "S" and "Z" twist) configurations. Belts made with "S" twist tensile cords track in the opposite direction to those built with "Z" twist cord. Belts made with alternating "S" and "Z" twist tensile cords track with minimal lateral force because the tracking characteristics of the two cords offset each other. The content of "S" and "Z" twist tensile cords varies slightly with every belt that is produced. As a result, every belt has an unprecedented tendency to track in either one direction or the other. When an application requires a belt to track in one specific direction only, a single twist construction is used. See Figures 16 & Figure 17. Angular Misalignment: Angular misalignment, or shaft nonparallelism, cause synchronous belts to track laterally. The angle of misalignment influences the magnitude and direction of the tracking force. Synchronous belts tend to track "downhill" to a state of lower tension or shorter center distance. Belt Width: The potential magnitude of belt tracking force is directly related to belt width. Wide belts tend to track with more force than narrow belts. Pulley Diameter: Belts operating on small pulley diameters can tend to generate higher tracking forces than on large diameters. This is particularly true as the belt width approaches the pulley diameter. Drives with pulley diameters less than the belt width are not generally recommended because belt tracking forces can become excessive. Belt Length: Because of the way tensile cords are applied on to the belt molds, short belts can tend to exhibit higher tracking forces than long belts. The helix angle of the tensile cord decreases with increasing belt length. Gravity: In drive applications with vertical shafts, gravity pulls the belt downward. The magnitude of this force is minimal with small pitch synchronous belts. Sag in long belt spans should be avoided by applying adequate belt installation tension. Torque Loads: Sometimes, while in operation, a synchronous belt will move laterally from side to side on the pulleys rather than operating in a consistent position. While not generally considered to be a significant concern, one explanation for this is varying torque loads within the drive. Synchronous belts sometimes track differently with changing loads. There are many potential reasons for this; the primary cause is related to tensile cord distortion while under pressure against the pulleys. Variation in belt tensile loads can also cause changes in framework deflection, and angular shaft alignment, resulting in belt movement. Belt Installation Tension: Belt tracking is sometimes influenced by the level of belt installation tension. The reasons for this are similar to the effect that varying torque loads have on belt tracking. When problems with belt tracking are experienced, each of these potential contributing factors should be investigated in the order that they are listed. In most cases, the primary problem will probably be identified before moving completely through the list. Two Pulley Drives: On simple two pulley drives, either one pulley should be flanged on both sides, or each pulley should be flanged on opposite sides. Multiple Pulley Drives: On multiple pulley (or serpentine) drives, either every other pulley should be flanged on both sides, or every pulley should be flanged on alternating sides around the system. Vertical Shaft Drives: On vertical shaft drives, at least one pulley should be flanged on both sides, and the remaining pulleys should be flanged on at least the bottom side. Long Span Lengths: Flanging recommendations for small synchronous drives with long belt span lengths cannot easily be defined due to the many factors that can affect belt tracking characteristics. Belts on drives with long spans (generally 12 times the diameter of the smaller pulley or more) often require more lateral restraint than with short spans. Because of this, it is generally a good idea to flange the pulleys on both sides. Large Pulleys: Flanging large pulleys can be costly. Designers often wish to leave large pulleys unflanged to reduce cost and space. Belts generally tend to require less lateral restraint on large pulleys than small and can often perform reliably without flanges. When deciding whether or not to flange, the previous guidelines should be considered. The groove face width of unflanged pulleys should also be greater than with flanged pulleys. See Table 27 for recommendations. Idlers: Flanging of idlers is generally not necessary. Idlers designed to carry lateral side loads from belt tracking forces can be flanged if needed to provide lateral belt restraint. Idlers used for this purpose can be used on the inside or backside of the belts. The previous guidelines should also be considered. 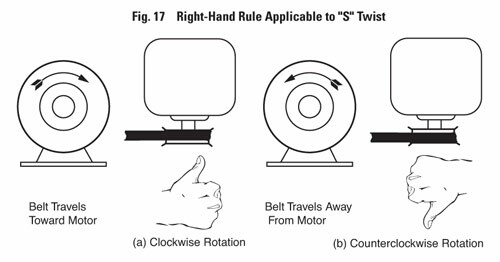 The three primary factors contributing to belt drive registration (or positioning) errors are belt elongation, backlash, and tooth deflection. When evaluating the potential registration capabilities of a synchronous belt drive, the system must first be determined to be either static or dynamic in terms of its registration function and requirements. Static Registration: A static registration system moves from its initial static position to a secondary static position. During the process, the designer is concerned only with how accurately and consistently the drive arrives at its secondary position. He/she is not concerned with any potential registration errors that occur during transport. Therefore, the primary factor contributing to registration error in a static registration system is backlash. The effects of belt elongation and tooth deflection do not have any influence on the registration accuracy of this type of system. Dynamic Registration: A dynamic registration system is required to perform a registering function while in motion with torque loads varying as the system operates. In this case, the designer is concerned with the rotational position of the drive pulleys with respect to each other at every point in time. Therefore, belt elongation, backlash and tooth deflection will all contribute to registrational inaccuracies. Belt Elongation: Belt elongation, or stretch, occurs naturally when a belt is placed under tension. The total tension exerted within a belt results from installation, as well as working loads. The amount of belt elongation is a function of the belt tensile modulus, which is influenced by the type of tensile cord and the belt construction. The standard tensile cord used in rubber synchronous belts is fiberglass. Fiberglass has a high tensile modulus, is dimensionally stable, and has excellent flex-fatigue characteristics. If a higher tensile modulus is needed, aramid tensile cords can be considered, although they are generally used to provide resistance to harsh shock and impulse loads. Aramid tensile cords used in small synchronous belts generally have only a marginally higher tensile modulus in comparison to fiberglass. When needed, belt tensile modulus data is available from our Application Engineering Department. Backlash: Backlash in a synchronous belt drive results from clearance between the belt teeth and the pulley grooves. This clearance is needed to allow the belt teeth to enter and exit the grooves smoothly with a minimum of interference. The amount of clearance necessary depends upon the belt tooth profile. Trapezoidal Timing Belt Drives are known for having relatively little backlash. PowerGrip HTD Drives have improved torque carrying capability and resist ratcheting, but have a significant amount of backlash. PowerGrip GT2 Drives have even further improved torque carrying capability, and have as little or less backlash than trapezoidal timing belt drives. In special cases, alterations can be made to drive systems to further decrease backlash. These alterations typically result in increased belt wear, increased drive noise and shorter drive life. Contact our Application Engineering Department for additional information. Tooth Deflection: Tooth deformation in a synchronous belt drive occurs as a torque load is applied to the system, and individual belt teeth are loaded. The amount of belt tooth deformation depends upon the amount of torque loading, pulley size, installation tension and belt type. Of the three primary contributors to registration error, tooth deflection is the most difficult to quantify. Experimentation with a prototype drive system is the best means of obtaining realistic estimations of belt tooth deflection. Select PowerGrip GT2 or trapezoidal timing belts. Design with large pulleys with more teeth in mesh. Keep belts tight, and control tension closely. Design frame/shafting to be rigid under load. Use high quality machined pulleys to minimize radial runout and lateral wobble.